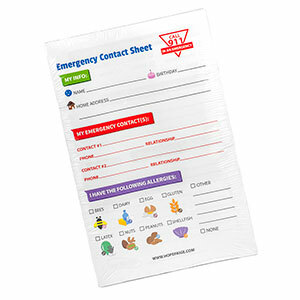 The In Case of Emergency Notepad is a great on-the-go tool to make sure your child's medical information is easily accessible. This item contains 50 sheets outlining the medical essentials you would need to pass along to babysitters, teachers, coaches, or other parents. Simply fill in your child's information with any standard writing utensil and you're good to go. Small enough to keep in your purse or in the glove box of your car you will never have to worry about forgetting it at home! This notepad makes the perfect back to school accessory and is available exclusively through Hope Paige.